Content is King. Mobile is Here. 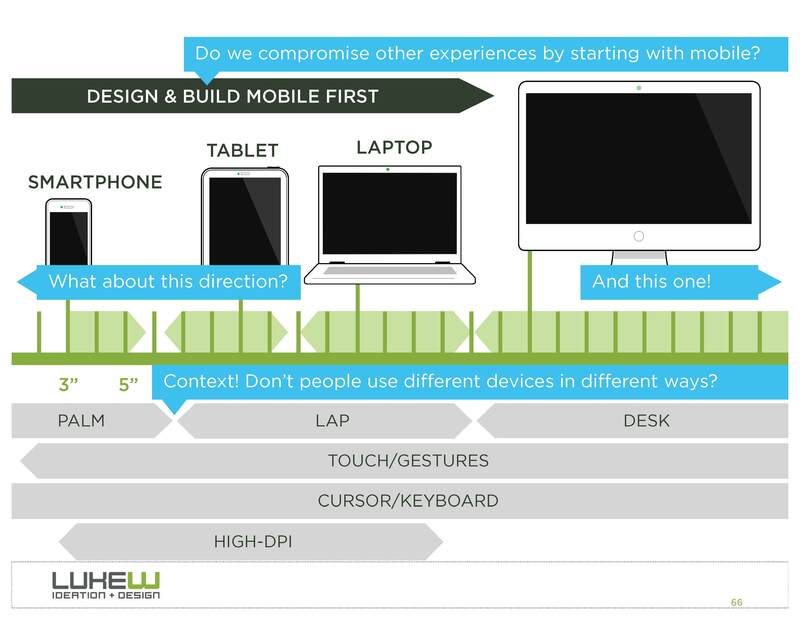 Responsive content is THE WAY. The speakers didn’t concentrate on specific tools but more concepts and strategies for success. Here are some of my faves. Style Tiles. Keeping in theme with content first and iterations of design and technology to fit multiple form factors, Style Tiles are the new way in my mind. We can no longer give the client a static mockup of the homepage and get them to approve that. This is a better way to convey to the client how the site will look and feel without designing ourselves into a hole. Style Tiles combined with wire frames and information architecture can guide the development team as they put things together. We can still make a design comp if the client really wants one but designing in HTML/CSS once the wireframes and content are approved will better serve a more systems-based approach allowing us to move our content around in order of importance using content-based breakpoints. Write Better Content Chunks. Its always a challenge to redesign a site and get the content to look as good as the design and back-end. Usually we leave this pretty much up to the client then we complain about how bad their content is. That’s wrong… making the content good is our job too and Im no longer going to pretend that its not. Luke W took some great notes on Karen McGrane’s talk about how to write for the web systems and a few case studies. Basically the best way (which has evolved from the whole separation of content and design discussion) is to write your content in chunks- much like journalists do. If you have editors write pages by filling in forms with fields like title, subheadline, short and long summary, image, image caption, by line, publish date, keywords, and so on, then you can rejigger that content in any way that you need for any situation! Jeffrey Zeldman, author, Designing With Web Standards, 3rd Ed.